Machine builders face increasing demands as manufacturers require simultaneous increases in efficiency and flexibility of systems; they have to completely rethink production cycles. For Gefasoft, the solution came in the combination of Beckhoff’s eXtended Transport System (XTS) and HepcoMotion’s innovative GFX guidance system. Gefasoft, an automation system developer in Regensburg, Germany, were commissioned to design an optical testing machine for airbag diffusers. In the event of an accident, diffusers determine the direction of airflow in the airbag. This critical component has to be examined and tested reliably for potential faults. The customer’s goal was to achieve an average cycle time of less than two seconds, despite there being 15 processes of varying durations. “This fast timing was a particular challenge,” says Georg Schlaffer, Head of Marketing at Gefasoft. The optical inspection of the diffusers uses several digital cameras at individual stations, with each inspection taking a different length of time to complete. At one station, the diffuser is rotated around a small digital camera to detect even the smallest defects on the inside. This complex process takes just under three seconds, whereas other test stations require just a fraction of this time. “A conventional system would be overwhelmed with such variations in test times. Also, it would not be easy to add new stations, or to adapt the system to other diffuser sizes as dictated by the customer,” he explains. Based on these requirements, the use of a typical rotary indexing table was out of the question; in this case, the slowest inspection process would determine the total cycle time. The desired flexibility in terms of additional operations and the ability to adapt the machine to the different diffuser sizes without great difficulty could not have been met with a typical system. Another challenging element to the design was the relatively high weight of the mover – approximately four kilograms. In order to be able to manipulate the diffusers for all-round inspection, the movers had to be equipped with lifting and rotation mechanisms. The solution offered by Beckhoff and HepcoMotion was capable of meeting these demands. 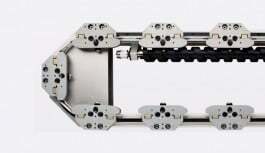 Beckhoff’s XTS linear drive system comprises a combination of linear and rotary motor modules with integrated electronics and position detection, as well as movers (carriages) that can be controlled as servo axes. Each mover can be individually controlled, allowing for on the fly product changes and opening up many possibilities for different time sequences in a production cell. “In the 1-Trak based GFX system, our track design is perfectly matched to the XTS. The clothoid curve elements from Beckhoff and Hepco provide smooth transitions and guarantee a consistently fast and precise movement,” says Alexander Mend, Sales Manager for HepcoMotion in Germany. “The handling of the relatively large weight on each mover is no problem, thanks to Hepco’s linear guide system. In addition, our specially developed three-bearing mover achieves minimal play around the corners, guaranteeing exact positioning in front of the cameras,” says the engineer. For Gefasoft, however, it was crucial that the combination of both systems would allow installation of the slowest workstation in two positions, allowing parallel function of this work step and achieving the desired average cycle time of 1.9 seconds. The final design of the new automatic optical inspection system included a total track length of 11 metres, on which 35 movers travel simultaneously through 15 inspection stations. Each mover is numbered with a different identifying code. Upon start-up of the system, the tools are initialised at an RFID station that identifies the position of each mover. This allows the position of movers to be monitored over the entire system. As a diffuser moves through each of the stations, the results of individual inspection cameras are transmitted to a computer. Here they are evaluated and the result is returned in time for the end of the testing process, where each diffuser is classified accordingly. “The construction of such a large production unit was new territory for us all,” says Schlaffer, Gefasoft’s Marketing Manager. “It was a learning process for us, but we would definitely use Beckhoff and HepcoMotion again for similar challenges.” The system has been working successfully for two years with our end user, showing the courage to try new things can pay off.